Defeat the Daedra emerging from a portal at Moonhenge. Moonhenge — Investigate the source of the Daedric invasion. I need to halt the Daedric invasion from Moonhenge. Find the portal keys and activate the pillars. The quest begins when you meet Scout Ruluril. He tells you that daedra have been pouring out of the nearby Ayleid ruin, Moonhenge. The daedra have captured several of the other scouts, and he asks you to rescue them. Each scout is held in place by a binding ritual, which you can destroy by interacting with it. The first scout, Scout Kilolemar, is behind the rocks directly across from the opening in the wooden fence. The next scout is up the path to the right. The final scout is next to the ruin, Moonhenge. After rescuing the last scout, you then rescue Sergeant Galandir, who's further up the path. He tells you to follow and runs off toward the center of the ruin. He says that when the squad arrived, they found the portal open, so Captain Ethrel and several other soldiers went through. Unfortunately, it was a trap, and daedra immediately poured out, capturing almost everyone. He says that the portal must be closed from the inside – to access the portal, the warding crystals around it must first be destroyed. He stays behind to guard the approach. 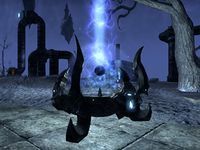 There are three warding crystals around the portal in the center, each linked to smaller portals and guarded by a couple of daedra. When you destroy each warding crystal, the smaller portal also disappears. After all three are destroyed, the portal to the Isles of Torment is unsealed. You arrive on the Isles of Torment just in time to see Captain Ethrel die with Sinien beside her. Sinien believes that the Moonhenge ruin in Tamriel is a duplicate of a structure in this plane. She thinks there's a sigil stone powering the portal between the two in this plane's Moonhenge, which can be accessed through a sealed gateway. She tells you to gather the other two squad members and find the keys to the gateway so you can access that sigil stone. She sneaks off to clear the gateway entrance while you do so. The Scout, Nara, is hiding to the south, near the Key of Discord. The Key of Discord is held by a dremora named Codaermet the Wicked, who you must kill. The Soldier, Hazazi, is hiding to the north, under the stairs leading to the Key of Strife. The Key of Strife is held by a dremora named Overseer Atris, who you must kill. Once you've found both Nara and Hazazi and collected both keys, you head northwest to the raised platform holding the Pillar of Strife and the Pillar of Discord. Everyone's already there, and Sinien tells you to hold the keys up to the pillars to unlock the gateway. This creates a Daedric Portal that everyone rushes into. The Sigil Stone is contained in the center of the Moonhenge twin. Just like in Tamriel, there are three crystals powering a seal protecting the stone. Sinien and the others begin trying to break the crystals, but she yells out that it will take some time. As you run toward the stone, a Harvester appears beside it, which you must defeat. Once you've defeated the Harvester, the others succeed in breaking the crystals, leaving the stone accessible. You grab it and run over to Sinien and the others. Sinien tells you that this Moonhenge is connected to the one in Greenshade, leaving it vulnerable to invasion by the Dremora unless the sigil stone is destroyed. She's created a scroll to do so, but it requires the power of the sigil stone, meaning whoever casts the spell will be trapped in the Isles of Torment. When you ask about destroying the Moonhenge in Tamriel instead, she scoffs. If you offer to cast the spell yourself, she refuses to let you sacrifice yourself. If you have the Intimidate skill, you can force her to give you the scroll. Otherwise, you have to choose who stays behind to cast the spell. If you cast the spell yourself, Sinien reluctantly agrees, and she and the other two disappear. After using the scroll, there are continuous explosions that you must avoid as you run to a portal back to Tamriel. The portal drops you back at the Altmer camp where you first got the quest, near Sergeant Galandir. Galandir is pleased that the portal's now closed, though sorry to hear of Captain Ethrel's death. When you tell him that you stayed to close the portal, he says that you "deserve a medal." Finishing the conversation with him completes the quest. If you've already completed the quests in Firsthold, Sinien refers to your time together when you first talk to her. If you've already completed the quests in Dread Vullain, Nara refers to your time together when you find her. If you've already completed the quests in Bramblebreach, Hazazi refers to your time together when you find him. Only Sergeant Galandir and the scouts appear in the Altmer camp after you return from the Isles of Torment. Sinien, Nara, and Hazazi aren't there.